On this page I have features the 6 types of hay available in Singapore. Although there are many brands, the comments on this page are general & can be applied regardless of the brand. However pictures of all types of hay (except meadow hay) are of Oxbow hay since they are the best brand for hay. Most of the info here are from Oxbow's website. 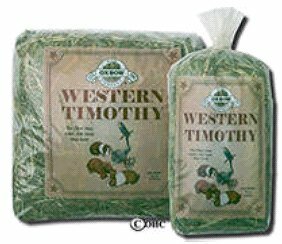 Oxbow calls their timothy hay "Western timothy" but I believe timothy is timothy regardless whether it is "Western" or not! Timothy hay is high in fibre, low in protein & low in calcium. It helps prevent obesity, maintains a healthy urinary system and improve overall health. Timothy is one of the most popular hays due to its reasonable price & easy availability. It can be fed daily in unlimited amounts. First cutting timothy is more mature, has more stems than leaves & is coarser. It is better since its fibre content is higher & protein content is lower than second cutting timothy. However most small animals don't enjoy it. Second cutting timothy is immature & has more leaves than stems. It is soft & hence small animals prefer it. For Oxbow first cutting timothy hay, the crude protein is 9.59%, crude fibre 30.9%, Acid Detergent Fibre (undigestable portion) 35%, calcium 0.42% & phosphorus 0.20%. For Oxbow second cutting timothy hay, the crude protein is 11.3%, crude fibre 25.3%, Acid Detergent Fibre (undigestable portion) 31.2%, calcium 0.73% & phosphorus 0.34%. Oxbow timothy is available in either 1.134 kg (40 oz) or 425 gm (15 oz) bags. Orchard grass looks similar to timothy but the seed heads have a different shape. Like timothy, orchard grass hay is low in protein and calcium, yet it provides the high fibre animals need for a healthy gastrointestinal tract. Orchard grass is a perennial cool season grass with flat leaf blades. The leaves vary in color from green to bluish-green depending on growing conditions. The lower surface of the leaf is not shiny & leaf sheaths can be somewhat rougher to the touch than timothy. Orchard grass is also known as "cocksfoot" in Europe, New Zealand & Australia. For Oxbow orchard grass hay, the crude protein is 12.1%, crude fibre 28.2%, Acid Detergent Fibre (undigestable portion) 36.9%, calcium 0.69% & phosphorus 0.40%. 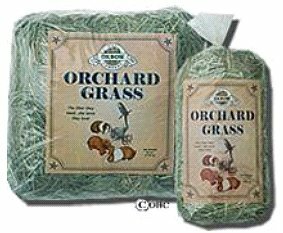 Oxbow orchard grass hay is available in either 1.134 kg (40 oz) or 425 gm (15 oz) bags. Oxbow calls their brome hay "bunny brome" however it is suitable for all small animals. Although it looks similar to timothy, Bunny Brome has a wider blade. With a different flavour, it adds variety to an animal's diet & is a good source of fibre. Brome hay is slightly higher in protein than timothy. It is a perennial grass that is grown in Eastern Europe, Russia & Canada as well as the north central part of the United States. It is high in fibre & low in protein. For Oxbow Bunny Brome, the crude protein is 12.6%, crude fibre 31.4%, Acid Detergent Fibre (undigestable portion) 35%, calcium 0.30% & phosphorus 0.09%. Oxbow bunny brome hay is available only in 425 gm (15 oz) bags. Oat Hay is a good source of fibre & most small animals love the oat grains attached in the head. The seed heads contain oat husks which are all fibre. Although oats cause bloat if over-eaten, there are no actual oat kernels present so there's no danger of bloating. If your furballs like crunchy food, this should be a hit with them! For Oxbow oat hay, the crude protein is 12.6%, crude fibre 30.1%, Acid Detergent Fibre (undigestable portion) 38.8%, calcium 0.46% & phosphorus 0.26%. Oxbow oat hay is available only in 425 gm (15 oz) bags. Alfalfa is actually not a hay but a legume. Its root, stem & leaf structure is different from grass hays like timothy, orchard grass & brome, hence resulting in higher protein, energy & calcium content compared to grass hays. Besides calcium, alfalfa is also a source of minerals like zinc, selenium, sulfur, iron, phosphorous, magnesium & potassium. Alfalfa is an outstanding feed for young cavies as it contains more crude protein, more digestible energy & a higher calcium level than any other forage. Alfalfa provides the calcium essential for growing bones. It is also a source of important minerals, including phosphorus, potassium, magnesium, sulfur, iron, zinc & selenium. Young cavies can be offered alfalfa hay on a daily basis in addition to their grass hay. As your cavies matures & calcium requirements decrease, gradually reduce the amount of alfalfa in the diet. Once your cavy is about 5 months old, slowly reduce its intake of alfalfa while increasing the amount of grass hay. The whole idea is to slowly convert it to grass hay so that by the time its 6 months old, it is on grass hay only. Although too much alfalfa is bad for mature cavies & hence should be given only as a treat, exceptions can be made. Alfalfa can be used to stimulate the appetite of ill animals & also help thin animals gain weight. 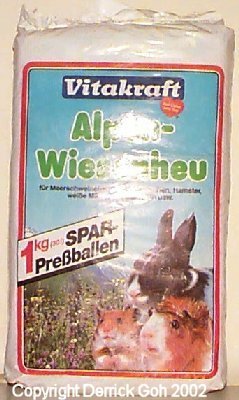 So if your mature cavy is ill, recovering from illness, pregant or recovering from pregnancy, you can offer it slightly more alfalfa then normal. For Oxbow alfalfa, the crude protein is 21.3%, crude fibre 28.5%, Acid Detergent Fibre (undigestable portion) 29%, calcium 1.1% & phosphorus 0.2%. Oxbow alfalfa is available only in 425 gm (15 oz) bags. Meadow hay can be fed free choice however most cavies don't seem to enjoy it. Vitakraft's meadow hay smells better than Supreme's but even then it wasn't too popular with my girls! It also appears to lack fibre compared to grass hay. In my opinion, meadow hay is better off being used as bedding rather than a feeding hay. It is dense, soft & fluffy making it ideal as bedding together with newspapers and/or shavings. It does tend to have clumps of soil so make sure you remove them. Meadow hay's crude protein is 7%, crude fibre 33%, Acid Detergent Fibre (undigestable portion) 44%, calcium 0.61% & phosphorus 0.18%.